Working with Professors Tom Brown (optics) and Matthew Yates (chemical engineering), Anthamatten will explore new ways to assemble and fix ceramic particles into ordered, inorganic, free-standing films. Chen will collaborate with Professors Alexander Shestopalov (chemical engineering), Jason Wallace (D'Youville College), Tanya Kosc (Laboratory for Laser Energetics), and Ksenia Dolgaleva (University of Ottawa) to advance his previously invented glassy liquid crystalline materials with the goal of achieving organic materials with high optical bandgap and minimal defects to maximize their laser damage resistance. Resulting materials from both projects could advance how polarization is controlled in laser systems, enabling better defined polarized light that could impact bioimaging, geo-sensing, and ultimately all laser-based military, space, and communication technologies. Both projects are part of a broader initiative, Advanced Materials for Powerful Lasers (AMPL), recently launched by Anthamatten and Chen. AMPL will leverage University strengths in advanced materials, optics and photonics, and laser technology, to develop new robust, optical materials that are critical to the fields of plasma physics and laser fusion. A two-day workshop will be held on June 25-26 in Wegmans Hall to inaugurate AMPL. 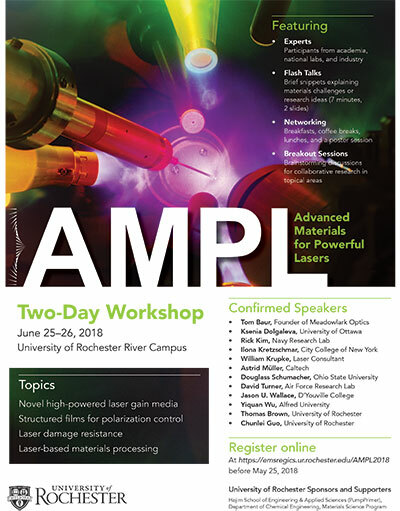 The workshop will feature participants from academia, industry, and national labs who will discuss novel laser gain media, structured films for polarization control, laser damage resistance, and laser-based materials processing.